I transferred into the University of Maryland after earning my A.S. in general engineering at a community college. I chose Maryland because I fell in love with the passion, mission and community that exists within the Fire Protection Engineering Department. At community college our ENES 100 class presented on different engineering disciplines, and I was picked to present on Fire Protection Engineering. So it was always a possibility in the back of my mind. When I was getting ready to transfer to a 4-year school, I wasn’t sure what discipline I specifically wanted to study. I just knew that I wanted to use my education (and eventually career) to help others. That same mindset is written into the mission of the FPE department. So I knew that if I chose to pursue this major, I would not only be equipped to be an engineer but also to use my skills to help other people. When I had the opportunity to tour the department before I transferred it became abundantly clear that not only is this field dedicated to that mission, but the entire department is as well. The community I immediately found and experienced within FPE has made a significant difference in my academics and in my life. The faculty are passionate about both this field and seeing their students learn and succeed. In my second semester in the department I had the opportunity to assist in a department research project and to become an NFPA student ambassador for the department. Both of these opportunities allowed me to become more invested in the department. The research project gave me an inside look at the work and experiments that go on in the laboratories and the impact they have on the industry at large, while the ambassador events allowed me to share my excitement for this major with high school students and incoming freshmen. Please explain your current research. Does this research connect to any co-ops or internships you've participated in? How does this research, and/or off-campus experience, tie into your future plans? This spring I am excited to begin research with Dr. Gollner on ignition of fuels in wildland fires. This semester I will be researching under a graduate student, Lana Benny, with the intention of taking on the research project in the fall when I begin my graduate studies. I have always been fascinated with the spread and effects of wildland fires, so I am looking forward to spending this next year researching this topic! Fluid dynamics was my favorite class. I loved seeing everyday occurrences explained through scientific and mathematical principles. The way that we are able to quantify and model natural things such as water flow are incredible and inspiring to me. As engineers and scientists, we have come so far and I get excited anticipating just how much farther we are able to go! Being accountable but flexible with your study schedule is hugely important as a student. Knowing what your brain can or can’t handle when you sit down to study saves a lot of frustration. Being in such a small department is a huge advantage as well. The professors are approachable and collaborating with other students is easy and helpful. You recently conducted an internship at Johnson Controls - what was that experience like? So, last summer, I worked in the JC fire domain. Many people don't realize this, but Simplex-Grinnell and Tyco are both part of the Johnson Control family, so I had some great interactions with both the sprinkler and the fire alarm sides of the industry. 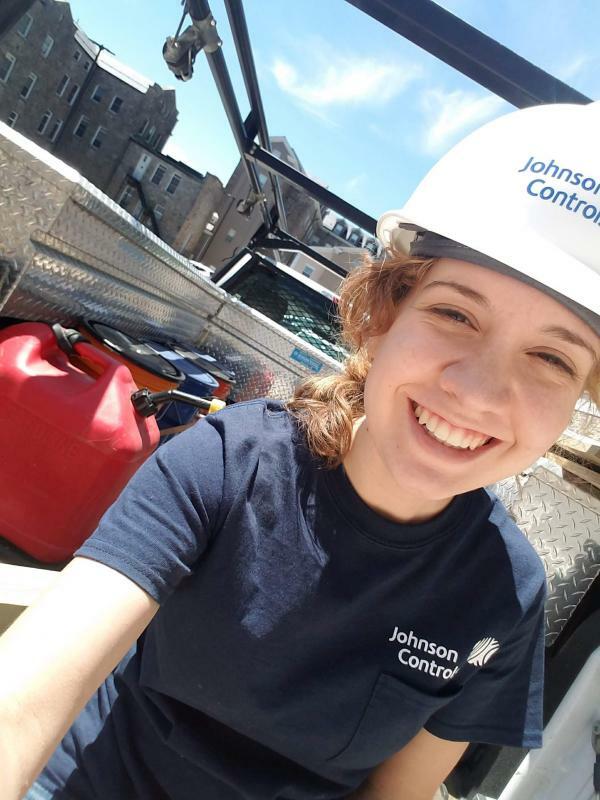 Half of my summer was spent in the field doing everything from survey and acceptance testing, to actually installing sprinkler pipes in buildings! It was a unique opportunity to see the concepts that I have learned in the classroom actually be applied and to see a different side of places than I normally do. The rest of my summer was spent in the department working on layout and design of both fire alarm and sprinkler systems. I was actually able to help assist in planning the layout for the fire alarm system in the new Iribe Center! I got a ton of incredible exposure and experiences in during my time with Johnson Controls, and I'm looking forward to taking those experiences with me moving forward in my career. I’m part of a few clubs on campus and in addition to going to their events, I enjoy spending time with my friends outside of the department. When the weather is nice, you’ll likely find me running around Lake Artemisia, climbing the rock wall, or playing disc golf at Calvert Road Park. I’m planning to spend my summer and this following year finishing my M.S. degree as a part of the accelerated bachelors/masters program within the department.